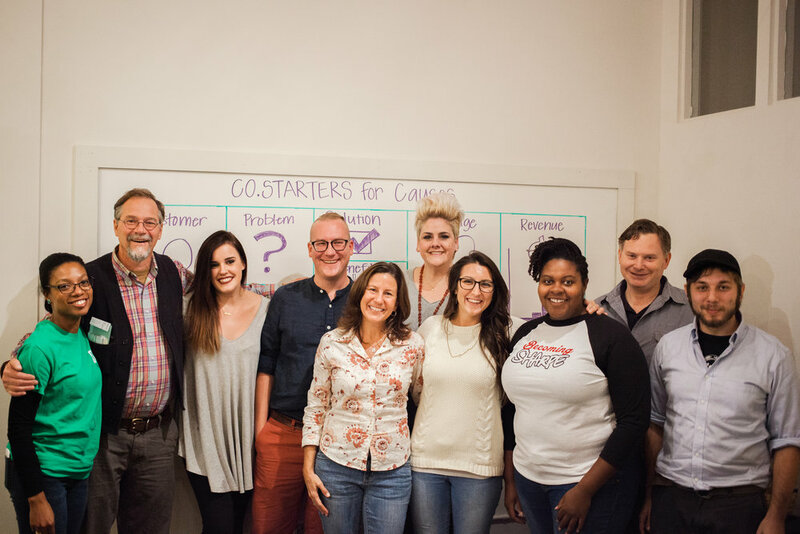 CO.STARTERS for Causes is a nine-week program that helps individuals put ideas into action, turning a passion for bettering the community into a sustainable and thriving endeavor. Our Spring cohort starts Wednesday, April 10, 2019. If you have a new idea for a project, nonprofit, or socially minded business – or you are an existing organization looking to become more sustainable or launch a new program - CO.STARTERS for Causes is for you. The only real prerequisites are (1) having an idea you're ready, willing, and excited to share and pursue and (2) a willingness to study, shape and fine-tune that idea in a supportive, collaborative, and welcoming environment. Each cohort will meet every Wednesday for 9 weeks, from 6-9pm. The course fee is $150, which includes course materials, office hours with the program facilitator to address your individual needs, and access to community events, networking opportunities, and other resources. We don’t want cost to be a barrier, so we offer a weekly payment plan of around $16 per class when needed. Summer cohort starts Wednesday, June 26, 2019. Fall cohort starts Wednesday, September 11, 2019. During Co.Starters, you're not being lectured. This is an action-driven, collaborative process with a small and supportive group of like-minded people, led by a facilitator who'll introduce concepts and help you immediately put them to work. You'll leave the program with a deep understanding of how to create a viable endeavor, and how to repeat that process with your next great idea. This class will focus on identifying and testing your assumptions, articulating your vision and mission, discovering personal strengths, and identifying obstacles. Before you can solve a problem, you have to understand it. This class will focus on identifying alternative solutions, getting into the mind of your customers and using feedback for your benefit. This week we will talk about the benefits of starting small, innovation, and competitive advantage. We will also focus on your concrete plans for distribution. A good idea that can’t be articulated isn’t making an impact. This week we will focus on your marketing, messaging, pitching and communications plan. The more you know about WHAT you need, the easier it is to get where you need to be. This week we will focus on specifically identifying your startup and ongoing needs. It’s no secret: we all need money to do what we do. By identifying your variable costs, making an accurate budget, and identifying funding sources, you can make your money work for you. You have a plan. Now you have to put it into action. Identifying roles, logistics and processes will help you do that. Setting goals for the future will keep you on track to become sustainable and open doors to replicate and share your idea. We will also focus on practicing a polished pitch for your idea.